I spent a week in Maui last September for my honeymoon and as much as we were looking forward to some R&R in the sun, we also wanted to experience a more adventurous side of Hawaii. After biking down a volcano on our first day in town, we planned two other exciting activities for our schedule – a zipline tour and a snorkeling excursion with sea turtles. We decided to use Flyin Hawaiian Zipline as our excursion company. They came with very high reviews and advertised themselves as the longest, highest, and fastest zipline course on Maui. Their 8 zipline courses range from 250 feet to 3,600 feet and the entire course is over 2.5 miles of high flying action. One of the added benefits about this company is their emphasis on conservatism. Most of their proceeds goes toward protecting Maui mountainsides from destruction and commercial development. They built their zipline course to be unobtrusive and with the lightest environmental footprint possible. From the road it was difficult to even see the lines are boarding stations that made up this giant zipline course. The tour was filled with educational lessons about the island’s history and how to protect it. During the tour we got to plant an endangered flower, which was a neat addition, knowing we were leaving a long-term positive impact on the area. The requirements to sign up for the tour were that all zipline riders must be at least 10 years old, weigh between 75 - 250 pounds, and be in good physical condition. Closed toed shoes were also required. Part of this was because there was some short hiking involved to get from tower to tower. They estimated that the hikes combined were about a mile. The total distance was short, but several of these were uphill and in the direct sun. There were 3 tour times to choose from: 7 am, 10 am, and 1 pm. Since the tour would take 4-5 hours, we opted for the earliest time slot, knowing the heat would be more bearable, and we’d still have most of the afternoon left to relax at the hotel. Check-in was fifteen minutes prior to our start time, and we had to drive about 20 minutes from our lodging, so it was an early wake-up, but completely worth it. Yes! The trip was a blast and the tour guides were great too. Safety was definitely their top priority, but they kept the trip entertaining as well as educational. As we felt more comfortable with the lines, the guides allowed us to try more advanced techniques, like going upside down, if we desired. There is a decent amount of time spent waiting while others in your group zip at each station, so you’ll you get to know the others in your group pretty well which was fun too. The tour includes free souvenir aluminum water bottle, snacks and drinks, eight ziplines, and two short but thrilling ATV rides between the mountain base and zipline course. I wholeheartedly recommend Flyin Hawaiian Zipline if you’re interested in a Ziplining tour in Maui. We knew we wanted to go snorkeling while in Hawaii, and I really wanted a boat ride too. Although not on the same level of thrill seeking as biking down a volcano or soaring hundreds of feet above valleys attached only to a steel wire, a snorkeling excursion was on our list. We booked our trip with Maui Snorkel Charters. This decision was based on good reviews, a smaller crowd (12-20 total passengers), their promise to go to multiple locations, and a schedule that worked with our itinerary. We signed up for their 4-hour Molokini Snorkeling Excursion package. The package included hot beverages at check-in, cold beverages, snacks and sandwiches on the boat, snorkeling equipment, instruction, and a free water resistant long sleeve tee to keep. The equipment was fairly high quality. They are flexible with their locations and number of stops based on weather conditions, visibility, and how crowded the spots are when you arrive. Our trip had check-in time at 7:30 am, and started at 8. We were given hot drinks and a continental breakfast at check-in, where we were fitted for our equipment. Once everyone was set up, we were brought to the boat, given safety instruction, and then sped away for about 20 minutes to our first stop. We probably had around 2.5 - 3 hours of snorkeling time across two different locations, which was plenty to see a lot of awesome fish. The best part of the trip was our last stop where we saw at least four sea turtles. There were no other tour groups at this location, so we didn’t have to fight crowds to follow the turtles around. We had lunch on the boat, and then rode back to the docks around noon. Yes, but although it was an overwhelmingly positive experience, I wouldn’t put the trip or company on a “can’t miss” list. I don’t have anything negative to say about the tour company, but they just didn’t wow me with over the top customer service in the way that our two other organized excursions in Maui did. That being said, the crew did seem very knowledgeable and friendly, and they did get us to some good, uncrowded locations. The experience was family friendly and appropriate for all ages. A couple additional recommendations - I definitely enjoyed having the smaller crowd and boat. It kept the experience more intimate, and made it quicker to get in and out of the boat, as well as led to a less crowded swim and ride. Also, when planning your trip, you definitely want to do an early morning snorkeling tour, because the winds pick up in the afternoon, which lead to rougher seas and less visibility of fish. I do think snorkeling is a must do in Hawaii, and booking an organized excursion is the best way to see an impressive variety of fish – and possibly turtles or dolphins. However, the excursion will require an early start, at least a half day time commitment, and some moderate expense. Alternatively, there are many shore locations attached to beaches and resorts that have snorkeling options. Equipment can be rented from hotels or shops in town. I can acknowledge that there are trade-offs to the experience, but I have no regrets since I personally really enjoy boat rides, and felt the sea turtle experience was unique and worth the price of admission itself. 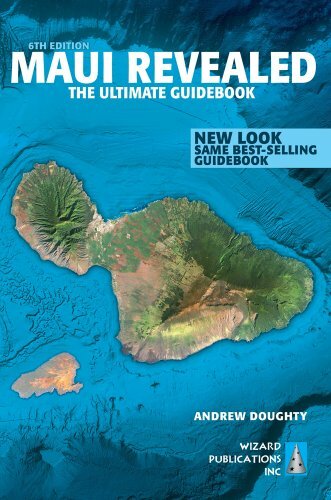 The main book we used to plan our Maui trip. They had a variety of reviews of ziplining and snorkeling excursion companies, as well as an extensive list of places you could snorkel along the coast on your own.